The Next Trillion is a 114-page abridged version of The Wellness Revolution designed to help introduce business opportunities in the next trillion dollar industry—Wellness! In The Next Trillion, Pilzer exposes the truth about why half the U.S. population is unhealthy and overweight: Americans have become caught between the economic interests of the trillion-dollar food industry and the trillion-dollar healthcare or “sickness” industry. In analyzing these two gigantic industrial complexes, Pilzer focuses on an emerging “wellness” industry that will soon occupy an additional one-seventh, or “next trillion,” of the economy—an industry ripe with entrepreneurial opportunities that will eclipse those of today’s Internet-based companies. 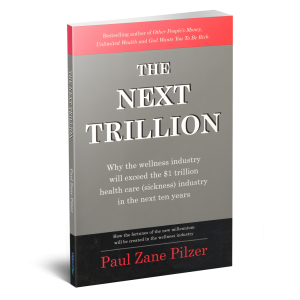 In The Next Trillion, Pilzer explains why consumers will turn away from consuming more material goods and instead seek to achieve internal self-improvement—healthier foods, vitamins, nutritional supplements and fitness programs—and why consumers will create a virtually limitless and sustained demand for wellness-based products. Many of the products that will take this new industry from a few billion dollars to a few trillion are still in the laboratory. Yet, as Pilzer explains, the greatest entrepreneurial opportunities will be in distributing rather than in manufacturing wellness products and services. The Next Trillion is for business people and consumers wanting to control where one-seventh of their earnings go every year. It is important for anyone who’s ever tried to control their weight or maximize their health, or for anyone working in today’s healthcare industry. And it is a critical must-read for entrepreneurs who want to know where the greatest opportunities lie ahead in the next two decades. Above all, The Next Trillion offers an exhilarating vision of health and fitness—true wellness that is far more than skin deep.